Pumpkins still adorn some front doorsteps and Halloween candies still sit on some shelves but with Thanksgiving coming early this year (Nov. 23) and stores looking for a cheerful buying season, holiday decorations and events are already going up and beckoning. If you have been downtown Chicago recently near Daley Plaza you likely noticed that the Christkindlmarket is already going up for its Nov. 17 opening and that Macy’s has already decorated its State Street and some Randolph Street windows. Its 45 foot high Great Tree is up in the Walnut Room sparkling with 2,000 ornaments and 6,600 lights. 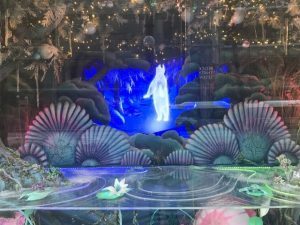 Macy’s State Stree windows are about Magic, pictured here, Love, Giving and other holiday themes. Photo by Carole Kuhrt Brewer. So yes, it’s somewhat early to plan on where to go for some holiday cheer of the non-alcholoic, event type. But if you don’t want to miss a fun activity, a repeat of a delightful family tradition or something that might start a new tradition, take a look at what’s coming up, print this and circle those events worth putting on your calendar. The events tend to fall into those that open Nov. 17 and the ones that start the day after Thanksgiving on Nov. 24. Head to Millennium Park before 6 p.m. to ooh and aah when the lights switch on the 62 foot Norway sprice donated by Darlene Dorfler, Grayslake. The Oakdale Christian Academy Choir will be singing and cast members from Goodman Theatre’s ‘A Christmas Carol’ will perform. Santa and Mrs. Claus are also expected to visit. Admission is free. The tree will be up through Jan. 6, 2018. 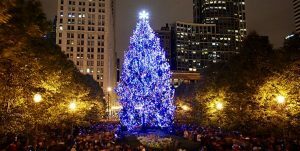 City of Chicago Tree lighting is Nov. 17, 2017. City of Chicago photo. 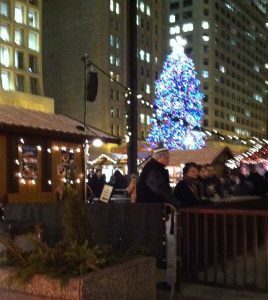 The Chicago Christkindlmarket opens weekdays 11 a.m. to 8 p.m. and stays open Friday-Saturday until 9 p.m. Location: Washington Street between Clark and Dearborn Streets. Admission free. For other information call (312) 494-2175. 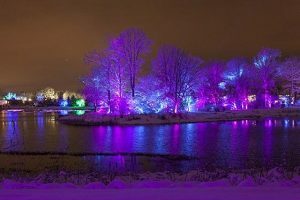 See trees from a different perspective when the Morton Arboretum has lights moving on them to music. In addition there is an Illu-medallion that can now be purchased to reflect the interactive light display. Tickets are date and time specific. Morton Arboretum is at 4100 Il Hwy 53, Lisle. For more information call (630) 968-0074. The festival opens Friday with activities and food from 4 to 8 p.m. in Lights Festival Lane (Pioneer Court) at 401 N. Michigan Avenue. The Michigan Avenue tree-lighting parade, sponsored by BMO Harris Bank and led by Mickey and Minnie Mouse, happens on Saturday at 5:30 p.m. after a day of activities starting at 11 a.m. at Pioneer Court and at Michigan Avenue shops. The parade begins at Oak Street and goes south to Wacker Drive ending with Fireworks at 6:55 p.m. .
Begun in 1942 with one tree, the exhibit now has a four-story, floor-to-dome Grand Tree plus more than 50 trees and displays. They are decorated by volunteers to represent many different cultures. MSI is at 5700 S. Lake Shore Drive. The European holiday market is now opening in other Chicago area attractions. On Nov. 24 it opens in Naperville at the Naper Settlement, 523 S Webster St, and at the Park at Wrigley, 3637 N. Clark St. If going to Wrigley, bring skates ($5 age 13 and older, free 12 and under) or rent them there because along with the Christkindlmarket the Park has an ice skating rink. If going there Nov. 28, take in the Tree-Lighting Ceremony when a Colorado Spruce tree from will sparkle with 2,700 bulbs. Instead of worrying about parking take the CTA Red Line or Clark bus 22 or Addison 152. Art Institute of Chicago’s annually welcomes the holidays with a wreathing of its famous lion statues at 10 a.m., then continues the day with hot chocolate, music and drop in art activities through 3 p.m. While there, stop downstairs at the Thorne Miniature rooms because they are fun to see and some even get a holiday decoration. The museum is at 111 S. Michigan Ave. 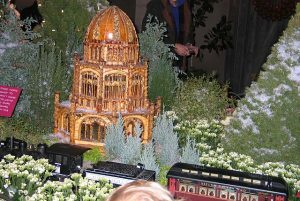 Both the Garfield Conservatory Holiday Show of Fire and Ice and the Lincoln Park Conservatory Holiday Flower Show open Nov. 24. For details visit Garfield Park Conservatory and Lincoln Park Conservatory.